Preheat the oven to 350˚ F. Line an 8×8″ baking pan with aluminum foil and spray lightly with cooking spray. In a small saucepan over medium heat, combine the butter and sugar. Bring to a boil, whisking frequently. Boil for 1 minute, then remove from the heat and set aside to cool slightly. In a medium mixing bowl, combine the flour, cocoa powder and salt; whisk together to combine. Add the eggs to the pan with the butter-sugar mixture and whisk until well blended. Whisk in the milk. Transfer the wet ingredients to the bowl with the dry ingredients and mix just until incorporated. Fold in the Oreo cookie pieces. Spread the batter into the prepared pan. To make the cream cheese mixture, combine the cream cheese, confectioners’ sugar and vanilla extract in the bowl of an electric mixer. Beat on medium-high speed until well-blended and smooth. Drop the cream cheese mixture over the brownie batter in dollops. 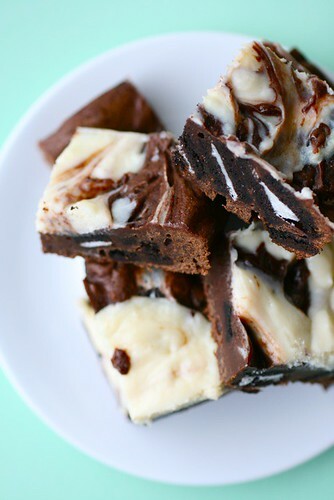 Use the blade of a knife to gently swirl the cream cheese mixture together with the brownie batter, creating a marble effect.